In a large bowl, pour all bread cubes into it, mix in butter, salt, garlic powder and cheese powder. Toss well until all cubes are coated with butter and other ingredients. Spread the bread cubes on a baking sheet. Bake 6 minutes, pull out, toss and turn cubes. Back to oven and continue baking for another 6 minutes or until golden brown and crisp. Remove from oven, serve with stew, creamy soup, salad or curry. If not consume immediately, store in airtight container. Let cool before storing. Croutons with creamy soups, croutons with salad, croutons with curry, there are so many ways to enjoy croutons. 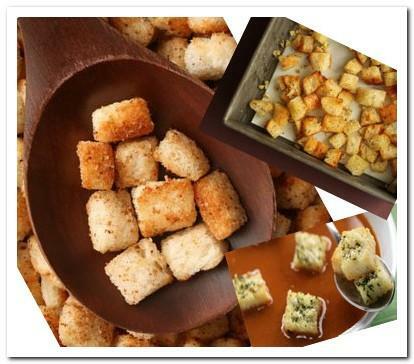 Make croutons at home, it is easy. Shapes and seasonings are flexible and it is fresh and crunchy. Bake in oven or toast on stove top, both fine and delicious. Add cheeses, herbs also fine, but make them plain is good too. Homemade croutons are fresh, easy and delicious.